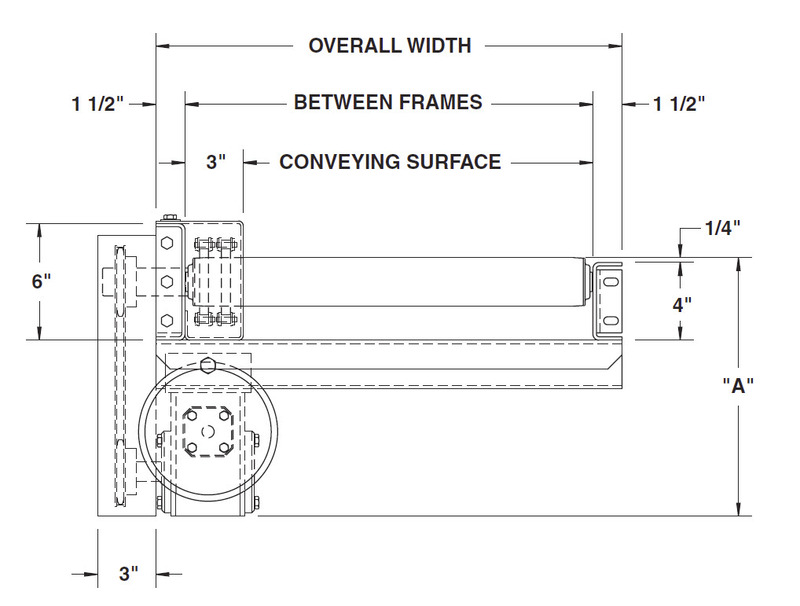 Model 251CDLR is a heavy duty chain driven live roller conveyor, specifically designed to transport heavy loads such as tote pans, castings, drums, pallet loads, and the like. It is especially suited for carrying loads in the presence of oil and other such contaminants. 2-1/2″ diameter x 11 gauge steel rollers, model 251S with sprockets. Removable type, heavy-duty ball bearings, zinc-plated, grease packed, labyrinth sealed. Roller bearings provide roller capacity of 540 lbs per roller maximum. Intermediate bed section lengths: 3′-0″, 3′-9″, 4′-6″, 5′-3″, 6′-0″, 6′-9″, 7′-6″, 8′-3″, 9′-0″, and 9′-9″ increments. Minimum overall conveyor length with drive: 5′-3″. Maximum overall conveyor length 58′-6″ with 4-1/2″ roller centers; 78′-0″ with 9″ roller centers. 6″ x 1-1/2″ x 7 gauge and 4″ x 1-1/2″ x 7 gauge formed steel channel frame. Bed sections attached with couplings and floor supports. Optional. SH-4 with underneath mounted drive adjustable 18″ to 21″ top-of-roller. SH-1 with side mounted drive adjustable 10-1/2″ to 12″ top-of-roller-. Supports provided on 5″ centers and should be mounted to the floor.